In a large pot with a lid that is big enough to fit the turkey, add all but 2 cups apple cider and bring to a boil over medium heat. Add the salt, 3 sprigs of thyme, 3 sprigs rosemary and stir to dissolve the salt. Remove from the heat, add 5 cups of ice, 6 cups water and stir. Put the turkey in the pot with the brine and hold it down so that the cavity fills with the brine. If the turkey is not completely submerged in the brine, add another 2 to 3 cups of water to the pot until covered. Cover the pot with a lid and refrigerate overnight or up to 24 hours. Remove the turkey from the brine, rinse and pat dry. Arrange it, breast side up, in a roasting pan. Stuff the remaining thyme and the bunch of sage into the cavity and tuck the wings back underneath the bottom of the breast. Tie the legs together with a piece of butcher’s twine. In a small bowl combine the canola oil, poultry seasoning and pepper. Brush the turkey liberally until completely coated. Put in the oven and roast until an instant-read thermometer inserted in the thickest part of the thigh registers 165 degrees F, about 2 1/2 to 3 hours. About 30 minutes before the turkey is done, liberally baste the bird with the cider glaze. Baste with the remaining glaze 2 more times at 10 minute intervals. 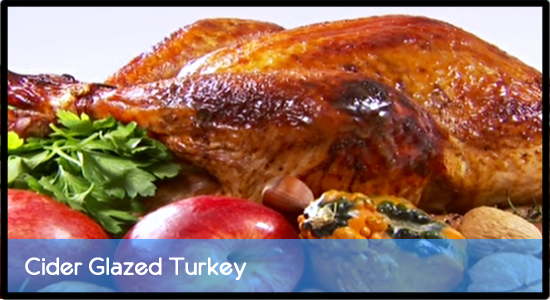 Remove from the oven and let rest at least 15 minutes before carving. Transfer to a serving platter and serve. In a small saucepan combine the reserved 2 cups of apple cider and 1/4 cup of brown sugar. Simmer until reduced to about 1/2 cup.